1 photograph; b & w; 5.5 x 3.25 in. (Left to right): curlers John Smith, ?, Ernest Hopkins, John Alstad, ?, and ? pose with rocks, brooms, and a trophy ouside a log building. 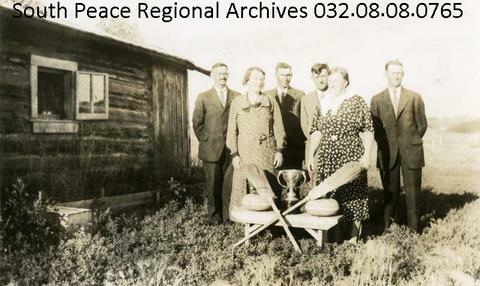 The photograph appears to have been contributed by the Grande Prairie District Old Timers’ Association.